The fourth crossing ... an artist’s impression. A major project on the anvil at Bahrain’s Ministry of Works, Municipalities Affairs and Urban Planning is Phase Two of the Muharraq Ring Road and the fourth Manama-Muharraq Crossing Project. The MoW is currently evaluating consultancy bids for the project, which starts from Dair-Diyar Al Muharraq and extends to Busaiteen, connecting the North Manama Causeway Interchange. The fourth flyover will connect Muharraq and the Capital and North Busaiteen and Bahrain Bay. According the Minister of Works, Municipalities Affairs and Urban Planning Essam bin Abdulla Khalaf, Phase Two of the project will be implemented in three stages, the first of which will target reclamation and levelling works. “Once work starts, traffic studies will be prepared and documents covering the second stage will also be completed,” explains Essam bin Abdulla Khalaf, the Minister of Works, Municipalities Affairs and Urban Planning. Stage Two comprises civil works and paving of dirt lanes. “In parallel to works involved in this stage, engineering designs for the marine flyover and the main interchange connecting to North Manama Causeway will also be implemented, forming the third of the project,” says Khalaf. The total length of the project is 7.8 km, which includes the 4.2-km-long Muharraq Ring Road and 3.6-km-long fourth crossing between the Interchange of Saya Project and North Manama Causeway. A 110-m-wide main road will also be part of the project. The fourth crossing will also connect Muharraq to Manama and the investment projects in Muharraq to the commercial areas in Manama – including Diplomatic Area, Bahrain Bay and Bahrain Financial Harbour – thus supporting economic development in Bahrain and serving economic and housing projects in North Muharraq. The flyover will also improve traffic flow to Bahrain International Airport and Khalifa bin Salman Port. Last October, Aecom, a global provider of professional technical and management support services, emerged as the lowest bidder to provide engineering consultancy services for the second phase of North Manama Causeway and Busaiteen Link. 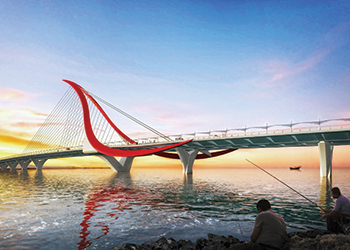 A total of six leading engineering companies submitted bids for the causeway project that will connect North Busaiteen and Bahrain Bay, according to an announcement on Bahrain’s Tenders Board website. Aecom submitted a low bid of BD4.91 million ($13 million).